Brain Injury Fundraiser – Act Like a Zombie | We Zombie! Stuff of New Zealand has an article talking about Brain Injury New Zealand’s fundraiser drive in the form of a zombie walk/dance. They are getting a lot of complaints regarding the use of zombie pop culture to bring attention and money to brain injury survivors. Brain Injury New Zealand president John Clough said no offense was intended and they certainly were not likening brain injury patients to the undead. “The zombie is a fictional character in horror movies that does not exist,” he said. My wife is always reminding me that zombies aren’t real – sounds like the same public relation problem I have. Anyway, event organizer Layla Robinson said “I know why I’m doing it and it’s not to upset people. I just have some pretty weird and wonderful taste[s].“ Layla and I are a lot alike. 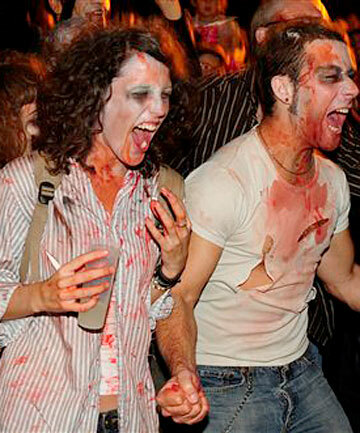 More information is in the Rotorua Zombie Walk Facebook Page. This entry was posted in News/Events. Bookmark the permalink.